Glycol ether solvents and fabric article treating compositions and fabric article treating methods employing such solvents are provided. This application claims priority under 35 U.S.C. §119(e) from Provisional Application Serial No. 60/432,455, filed on Dec. 11, 2002. In still another aspect of the present invention, a fabric article treated by the composition and/or the method according to the present invention is provided. As used herein, the term “oil solvency” means the ability of a solvent to dissolve an oily substance. In the dry cleaning industry, it is typically measured by the Kauri Butanol value (KB value). The measurement method and KB values of common dry cleaning solvents are well known to those skilled in the art and can be found in standard references (Kirk-Othmer Encyclopedia of Chemical Technology, 4 th ed., vol. 22, pp. 529-571). The KB can also be determined by a standard test method ASTM B 1133. The solvents of the present invention exhibit an oil solvency, as measured by KB value, of greater than 10, preferably greater than 15, more preferably greater than 20, even more preferably greater than 30, and most preferably greater than 35, up to the solvency of Kauri resin in butanol. Polar solvents suitable for use in the present invention can be further identified through their Hansen solubility parameters, including their dispersive force (D), polarity (P) and hydrogen bonding (H). Preferred polar solvents or polar solvent mixtures have fractional polarity (f P) and fractional hydrogen bonding (fH) values of fP>0.02 and fH>0.10, where fP=P/(D+P+H) and fH=H/(D+P+H), more preferably fP>0.05 and fH>0.20, and most preferably fP>0.07 and fH>0.30. b) fatty alcohol ethoxylates, R—(OCH 2CH2)aOH a=1 to 100, typically 12-40, R=hydrocarbon residue 8 to 20 C atoms, typically linear alkyl. Examples polyoxyethylene lauryl ether, with 4 or 23 oxyethylene groups; polyoxyethylene cetyl ether with 2, 10 or 20 oxyethylene groups; polyoxyethylene stearyl ether, with 2, 10, 20, 21 or 100 oxyethylene groups; polyoxyethylene (2), (10) oleyl ether, with 2 or 10 oxyethylene groups. Commercially available examples include, but are not limited to: ALFONIC, BRIJ, GENAPOL, NEODOL, SURFONIC, TRYCOL; additional examples are described in U.S. Pat. No. 6,013,683, issued to Hill et al. wherein R 8 is an alkyl group or an alkyl aryl group, selected from the group consisting of primary, secondary and branched chain alkyl hydrocarbyl groups, primary, secondary and branched chain alkenyl hydrocarbyl groups, and/or primary, secondary and branched chain alkyl- and alkenyl-substituted phenolic hydrocarbyl groups having from about 6 to about 20 carbon atoms, preferably from about 8 to about 18, more preferably from about 10 to about 15 carbon atoms; s is an integer from about 2 to about 45, preferably from about 2 to about 20, more preferably from about 2 to about 12; B is a hydrogen, a carboxylate group, or a sulfate group; and linking group Z is —O—, —C(O)O—, —C(O)N(R)—, or —C(O)N(R)—, and mixtures thereof, in which R, when present, is R8 or hydrogen. In some embodiments, the nonionic surfactants are alkyl ethoxylate surfactants with each R 8 being C8-C16 straight chain and/or branch chain alkyl and the number of ethyleneoxy groups s being from about 2 to about 6, preferably from about 2 to about 4, more preferably with R8 being C8-C15 alkyl and s being from about 2.25 to about 3.5. These nonionic surfactants are characterized by an HLB of from 6 to about 11, preferably from about 6.5 to about 9.5, and more preferably from about 7 to about 9. Nonlimiting examples of commercially available alkyl ethoxylate surfactants are Neodol® 91-2.5 (C9-C10, s=2.7, HLB=8.5), Neodol® 23-3 (C12-C13, s=2.9, HLB=7.9) and Neodol® 25-3 (C12-C15, s=2.8, HLB=7.5). Neodol® are available from Shell Chemicals. Further nonlimiting examples include nonionic surfactants selected from the group consisting of fatty acid (C 12-18) esters of ethoxylated (EO5-100) sorbitans. In some embodiments, the surfactant is selected from the group consisting of mixtures of laurate esters of sorbitol and sorbitol anhydrides; mixtures of stearate esters of sorbitol and sorbitol anhydrides; and mixtures of oleate esters of sorbitol and sorbitol anhydrides. In one specific embodiment, the surfactant is selected from the group consisting of Polysorbate® 20, which is a mixture of laurate esters of sorbitol and sorbitol anhydrides consisting predominantly of the monoester, condensed with about 20 moles of ethylene oxide. In another embodiment, the Polysorbate® 60 which is a mixture of stearate esters of sorbitol and sorbitol anhydride, consisting predominantly of the monoester, condensed with about 20 moles of ethylene oxide. In yet another embodiment, the Polysorbate® 80 which is a mixture of oleate esters of sorbitol and sorbitol anhydrides, consisting predominantly of the monoester, condensed with about 20 moles of ethylene oxide; and mixtures thereof. In another embodiment, the anionic surfactants include alkyl alkoxylated sulfate surfactants hereof are water soluble salts or acids of the formula RO(A) mSO3M wherein R is an unsubstituted C10-C24 alkyl or hydroxyalkyl group having a C10-C24 alkyl component, preferably a C12-C20 alkyl or hydroxyalkyl, more preferably C12-C18 alkyl or hydroxyalkyl, A is an ethoxy or propoxy unit, m is greater than zero, typically between about 0.5 and about 6, more preferably between about 0.5 and about 3, and M is H or a cation which can be, for example, a metal cation (e.g., sodium, potassium, lithium, calcium, magnesium, etc. ), ammonium or substituted-ammonium cation. Alkyl ethoxylated sulfates as well as alkyl propoxylated sulfates are contemplated herein. wherein each R substituent is selected from hydrogen; a short chain C 1-C6 alkyl or hydroxyalkyl, preferably methyl. ethyl, propyl, or hydroxyethyl, and more preferably methyl; poly(C1-C3 alkoxy), preferably polyethoxy; benzyl; or a mixture thereof; each m is 2 or 3; each n is from 1 to about 4; each Y is —O—(O)C—, —C(O)—O—, —NR—C(O)—, or —C(O)—NR—; the sum of carbons in each R1, plus one when Y is —O—(O)C— or —NR—C(O)—, is C12-C22, preferably C14-C20, with each R1 being a hydrocarbyl, or substituted hydrocarbyl group, and A− can be any softener-compatible anion, preferably, chloride, bromide, methylsulfate, ethylsulfate, sulfate, and nitrate, more preferably chloride or methyl sulfate. (As used herein, the “percent of softening active” containing a given R1 group is based upon taking a percentage of the total active based upon the percentage that the given R1 group is, of the total R1 groups present.). wherein each R is H, a short chain C 1-C6 alkyl or hydroxyalkyl, preferably methyl, ethyl, propyl, or hydroxyethyl, and the like, more preferably methyl, benzyl, or (R2O)2-4H; each R1 is a C6-C22, preferably C14-C20 hydrocarbyl, or substituted hydrocarbyl substituent, preferably C10-C20 alkyl or alkenyl (unsaturated alkyl, including polyunsaturated alkyl, also referred to sometimes as “alkylene”), most preferably C12-C18 alkyl or alkenyl; each R2 is a C1-C6 alkylene group, preferably an ethylene group; and A− are defined as below. wherein each m is 2 or 3, each R 1 is a linear or branched, saturated or unsaturated C6-C22 moiety, preferably C14-C20 moiety, but no more than one being less than about C12 and then the other is at least about C16; or hydrocarbyl or substituted hydrocarbyl substituent, preferably C10-C20 alkyl or alkenyl, most preferably C12-C18 alkyl or alkenyl. 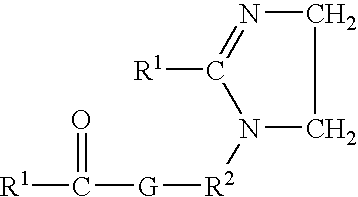 wherein each R, R 1, and A− have the definitions given above; each R2 is a C1-C6 alkylene group, preferably an ethylene group; and G is an oxygen atom or an —NR— group. wherein R 7 is hydrogen or a C1-C4 saturated alkyl or hydroxyalkyl group, and R1 and A− are defined as hereinabove. wherein R 1, R2 and G are defined as above in (6). 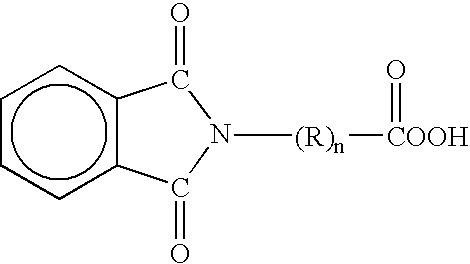 wherein R 1, R2 are defined as above in (6), and each R3 is a C1-C6 alkylene group, preferably an ethylene group. Examples of Compound (8) include Emersol® 223LL and Emersol® 7021, which are available from Henkel Corporation. wherein R, R 1, R2, R3 and A− are defined as above in (6) and (8). An example of Compound (9) is a difatty amidoamine based softening active available commercially from the Witco Corporation under the trade name Varisoft® 222LT. wherein R 4is an acyclic aliphatic C8-C22 hydrocarbon group and A− is an anion. wherein R, R 1, R2 and A− are defined as herein above in (6) and (9). In the cationic nitrogenous salts herein, the anion A −, which is any softening active compatible anion, provides electrical neutrality. 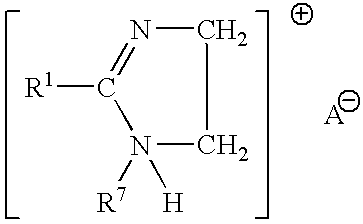 Most often, the anion used to provide electrical neutrality in these salts is from a strong acid, especially a halide, such as chloride, methylsulfate, bromide, or iodide. However, other anions can be used, such as ethylsulfate, acetate, formate, sulfate, carbonate, and the like. Chloride and methylsulfate are preferred herein as anion A−. Bleaches, especially oxygen bleaches, are another type of adjunct ingredient suitable for use in the compositions of the present invention. This is especially the case for the activated and catalyzed forms with such bleach activators as nonanoyloxybenzenesulfonate and/or any of its linear or branched higher or lower homologs, and/or tetraacetylethylenediamine and/or any of its derivatives or derivatives of phthaloylimidoperoxycaproic acid (PAP) or other imido- or amido-substituted bleach activators including the lactam types, or more generally any mixture of hydrophilic and/or hydrophobic bleach activators (especially acyl derivatives including those of the C 6-C16 substituted oxybenzenesulfonates). wherein R is C 1-4 alkyl and n is an integer of from 1 to 5. A particularly preferred peracid has the formula where R is CH2 and n is 5 i.e., phthaloylamino peroxy caproic acid (PAP) as described in U.S. Pat. Nos. 5,487,818, 5,310,934, 5,246,620, 5,279,757 and 5,132,431. PAP is available from Ausimont under the tradename Euroco®. Suitable adjuncts may also comprise co-surfactants, such as primary alkylamines comprising from about 6 to about 22 carbon atoms are used. Particularly preferred primary alkylamines are oleylamine (commercially available from Akzo under the tradename Armeen® OLD), dodecylamine (commercially available from Akzo under the tradename Armeen® 12D), branched C 16-C22 alkylamine (commercially available from Rohm & Haas under the tradename Primene®), and mixtures thereof. Preferred insect and moth repellent adjunct ingredients useful in the compositions of the present invention are perfume ingredients, such as citronellol, citronellal, citral, linalool, cedar extract, geranium oil, sandalwood oil, 2-(diethylphenoxy)ethanol, 1-dodecene, etc. Other examples of insect and/or moth repellents useful in the compositions of the present invention are disclosed in U.S. Pat. Nos. 4,449,987; 4,693,890; 4,696,676; 4,933,371; 5,030,660; 5,196,200; and in “Semio Activity of Flavor and Fragrance Molecules on Various Insect Species”, B. D. Mookherjee et al., published in  Bioactive Volatile Compounds from Plants, ACS Symposium Series 525, R. Teranishi, R. G. Buttery, and H. Sugisawa, 1993, pp. 35-48. 2. The composition according to claim 1 wherein the adjunct ingredient comprises a polar solvent. 3. The composition according to claim 2 wherein the polar solvent is selected from the group consisting of water, alcohols, glycols, polyglycols, ethers, carbonates, dibasic esters, ketones, other oxygenated solvents, and mixutures thereof. 4. The composition according to claim 3 wherein the polar solvent comprises from about 0.001% to about 10% by weight of the fabric article treating composition. 5. The composition according to claim 1 wherein the adjunct ingredient is an additive selected from the group consisting of: builders, surfactants, enzymes, bleach activators, bleach catalysts, bleach boosters, bleaches, alkalinity sources, antibacterial agents, colorants, perfumes, pro-perfumes, finishing aids, lime soap dispersants, odor control agents, odor neutralizers, polymeric dye transfer inhibiting agents, crystal growth inhibitors, photobleaches, heavy metal ion sequestrants, anti-tarnishing agents, anti-microbial agents, anti-oxidants, anti-redeposition agents, soil release polymers, electrolytes, pH modifiers, thickeners, abrasives, divalent or trivalent ions, metal ion salts, enzyme stabilizers, corrosion inhibitors, polyamines and/or their alkoxylates, suds stabilizing polymers, solvents, process aids, fabric softening agents, optical brighteners, hydrotropes, suds or foam suppressors, suds or foam boosters and mixtures thereof. 6. The composition according to claim 5 wherein the additive comprises from about 0.001% to about 10% by weight of the fabric article treating composition. 7. A method for treating a fabric article in need of treatment comprising the step of contacting the fabric article with a fabric article treating composition comprising a glycol ether solvent according to claim 1 such that the fabric article is treated. 8. The method according to claim 7 wherein the fabric article treating composition further comprises an adjunct ingredient selected from the group consisting of a polar solvent, an additive, and mixtures thereof. 9. The method according to claim 8 wherein the adjunct ingredient is a polar solvent selected from the group consisting of water, alcohols, glycols, polyglycols, ethers, carbonates, dibasic esters, ketones, other oxygenated solvents, and mixtures thereof. 10. The method according to claim 9 wherein the polar solvent comprises from about 0.001% to about 10% by weight of the fabric article treating composition. 11. The method according to claim 8 where in the adjunct ingredient is an additive selected from the group consisting of: builders, surfactants, enzymes, bleach activators, bleach catalysts, bleach boosters, bleaches, alkalinity sources, antibacterial agents, colorants, perfumes, pro-perfumes, finishing aids, lime soap dispersants, odor control agents, odor neutralizers, polymeric dye transfer inhibiting agents, crystal growth inhibitors, photobleaches, heavy metal ion sequestrants, anti-tarnishing agents, anti-microbial agents, anti-oxidants, anti-redeposition agents, soil release polymers, electrolytes, pH modifiers, thickeners, abrasives, divalent or trivalent ions, metal ion salts, enzyme stabilizers, corrosion inhibitors, polyamines and/or their alkoxylates, suds stabilizing polymers, solvents, process aids, fabric softening agents, optical brighteners, hydrotropes, suds or foam suppressors, suds or foam boosters and mixtures thereof. 12. The method according to claim 11 wherein the additive comprises from about 0.01% to about 10% by weight of the fabric article treating composition. 13. The method according to claim 7 wherein the fabric article comes into contact with the glycol ether solvent and the adjunct ingredient simultaneously or sequentially. 14. The method according to claim 13 wherein the adjunct ingredient selected from the group consisting of a polar solvent, an additive, and mixtures thereof. 15. The method according to claim 14 wherein the additive is mixed within the glycol ether solvent and/or the polar solvent. 16. The method according to claim 7 wherein the fabric article treating composition comprising a glycol ether solvent is applied to the fabric article in a non-immersive step. 17. The method according to claim 7 wherein the fabric article treating composition comprising a glycol ether solvent is applied to the fabric article such that the weight ratio of the composition to the dry fabric article is less than about 5:1. 18. A fabric article treated by the method according to claim 7. 19. A fabric article treated by the composition according to claim 1. FR3001235A1 (en) * 2013-01-22 2014-07-25 Arcane Ind Method and Dry Cleaning installation textile articles by means of a composite solvent and recycling of the composite solvent use for reuse. MXPA04011328A (en) 2005-02-14 Rinse-added fabric treatment composition and methods and uses thereof. ES2262857T3 (en) 2006-12-01 Dry cleaning process.